This type of Allergy requires the intervention of a team of doctors, where everyone is responsible for their part of the treatment, but initially it is recommended to visit the dentist. The culprit of such disease becomes an allergen that has entered the organism from the outside or in contact with the mucosa. If you take into account the first option, here allergic stomatitis manifests as the body’s response to the ingress of pollen, medicines or food to which you have intolerance. The second option is the unbearable contact of the substance with the mucosa in the oral cavity, for example, they become dental medicine, pastes, medicated mouth rinses. In addition, the stomatitis often occurs when establishing dental and orthodontic appliances, as well as during anesthesia. For example, in acrylic dentures becomes allergenic dye or fluid for hardening, and a metal alloy, which is a system. In addition, the mechanism of origin of this pathology is involved carious education and chronic inflammation of the tonsils. As for dentures, they accumulate the bacteria causing irritation. Contact type disease, which was caused by allergic reactions often is diagnosed in people with diseases of the gastrointestinal tract and parasites, as well as with incorrect thyroid or endocrine diseases such as diabetes or menopausal disorders. Such factors affect the body’s sensitivity to allergens and greatly increase the chances of occurrence of pathology. Pathology of the connective tissue, in which it becomes denser (scleroderma). All these cases are only a small part of a huge number of pathologies for which you first need to treat the disease, and then stomatitis. Allergic stomatitis in children as in adults, mainly acts as the body’s reaction to an intolerance to a particular substance, which fell into the human body, both outside and in direct contact with the mucosa. It is worth noting that kids are exposed to this disease much more often than adults because of lower body resistance before allergens and more sensitive mucosa in the oral cavity. Allergic stomatitis is divided into species, which were named depending on how it manifests itself. 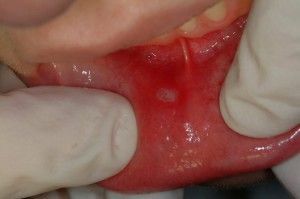 Inflammatory process with areas prone to necrosis (ulcer-necrotic). In addition, its pathology is divided into immediate and delayed. For the first type characterized by swift current in form resembling angioneurotic angioedema. The second type is usually invisible in the first few days and initially does not show, as in the case with dental structures that can pass and is more than 10 years. It should be noted that each form has its particular symptoms and treatments. 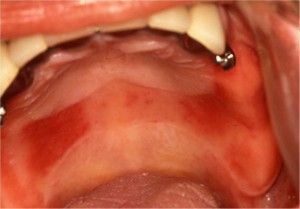 During the inspection highlighted language with a shiny surface, and if it is the hemorrhagic form is added to symptoms of hemorrhage into the mucosa. Allergic stomatitis bullous form is characterized by the presence of bubbles on the surface of the mucosa and it often happens that once a vial was opened, the pathology goes into erosive form appears and fibrinous plaque. When these ulcers begin to appear, it is accompanied by severe pain and particularly it becomes noticeable during meals or conversation. Such defects pathology can be combined into a single greater erosion, which only exacerbates the discomfort. Accompanying symptoms may be noted General weakness, fever and poor appetite. You need to understand that the treatment will need to make a detailed diagnosis and the knowledge of these reasons can make it easier. Initial diagnosis is conducted by the dentist, but if the stomatitis is not only its direction, then the study can attract another doctor. To do this, it will be important to collect as much information as possible about a possible allergen to it as quickly as possible to identify and begin treatment. At the baseline examination, the physician should see the state of the mucosa, and the presence of dental and orthodontic appliances and find out how long ago they were installed and what it consists of. 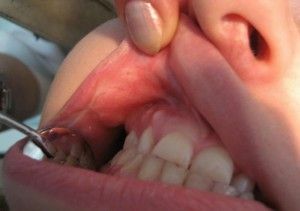 READ How to pull a baby tooth in a child at home without pain? Then there is chemical composition of saliva and its pH level. This will allow you to see the minerals and their quantities, as well as what occurs in the moment of an electrochemical reaction. If necessary, the doctor can make biochemical analysis to see the activity of enzymes and to know the pain threshold. In addition, it is necessary to analyze the composition of the established designs or dentures and can make allergic tests and get scraping with the mucosa, to check for Candida albicans. All these procedures are important to search for the culprit and for the subsequent treatment of the pathology. The course of treatment the doctor will prescribe the results of the survey, which was supposed to be the cause of allergic-type disease. First, you need to avoid contact with a particular substance (prosthesis, food, medicine, toothpaste, mouthwash, etc.) that caused an allergic reaction. Next, the doctor will prescribe antihistamines and vitamin complexes. In a hospital setting will be added to the treatment with antiseptic agents, and anti-inflammatory and corticosteroid medications. As for domestic conditions, the dentist will certainly recommend the herbal teas and rinses mouthwash. Thus, allergic stomatitis responds well to treatment after diagnosis, which was revealed the perpetrator of the disease.